As advocates for international schools and libraries, we understand the excitement of book award and honor winners and having the information as soon as possible. We wanted to take this opportunity to share with you the list of all of the American Library Association's 2012 Award and Honor titles that were announced this morning. In addition, make sure to read about our Give Away at the bottom of this email message! Kadir Nelson, author and illustrator of "Heart and Soul: The Story of America and African Americans"
· Kadir Nelson, illustrator and author of "Heart and Soul: The Story of America and African Americans"
· "Over Sea, Under Stone"
· "The Dark Is Rising"; "Greenwitch"
· "Silver on the Tree"
If you are interested in the many other Awards and Honors posted at the ALA Mid-Winter Conference, please let us know and we will send you the complete list. 1. Registrations must be from an International School (Librarian, Teacher or Administrator) or International Librarian. 2. Registrations need to be sent to giveaway@jennifer-nelson.com and MUST include the following information: name, job title, school name and email address. 3. Registrations need to be submitted on or before 9:00 AM US CST Tuesday January 31, 2012. 4. Winner(s) will be announced on our Facebook Page (www.facebook.com/jennifernelsonllc ) and Twitter account (@jnelsonllc) on Thursday February 2, 2012. If you would like for us to send you an easy to complete Order Form for the above Award and Honor titles, please let us know. 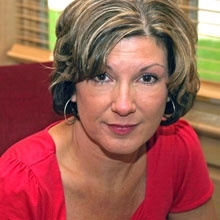 In addition, the Award and Honor Lists will be posted on Children's Plus, Inc.'s website at www.childrensplusinc.com. Please let us know if we can be of any assistance with your book, AV, furniture, supply and automation needs! We are here to be of assistance to you! I would like to invite you to follow us on Twitter and connect with us on Facebook and Sklobal. A very happy New year from the team at Tulika Books, Singapore! We are emailing to inform you about Jeeva Raghunath's visit to Singapore next month. Jeeva Raghunath is an acclaimed author and storyteller who has written a number of Tulika Books. A primary teacher by training, Jeeva started telling stories from the age of 5 as she grew up amidst excellent storytellers. Thanks to Tulika Publishers who gave her the responsibility of translating an activity-based storybook into Tamil, she was introduced to the public as a storyteller. She has now grown to be a resource person, representing India at many international conferences. Jeeva's lively and dramatic storytelling performances keep all ages spell-bound. She believes that she is the best prop for her storytelling though she occasionally uses hand-puppets, paper and sign language. Stories include a wide range of Indian and Asian folk-tales, European tales, family stories, true life incidents, cross-culture stories and modern stories. She is now an author of children's books and has translated 17 books and written two original stories two Tamil (regional Indian language) letters book. She has performed for many private television channels including Vasantham. Her original writings include Malli (bilingual), Gadagada Gudugudu (Tamil), Kasakasa (Tamil). Her voice can be heard on many audio recordings as well including "Stories from India" with Roger Jenkins- drama plus arts- Singapore. Jeeva's professional experience has taken her all over the globe, including Toronto, Cayman Islands, Toronto, Singapore, Malaysia. She is a founder member of the World Storytelling Institute, Chennai. Jeeva will be in Singapore in February 2012. She can do readings from any of the Tulika titles. She is also available for workshops to train teachers in improving children's language skills through story telling. Her storytelling rates are SG$200 for a half- hour session and SG$500 for a teachers' workshop. Please let me know if we can explore this. We would be happy to set up a stall at your school for the sale of Tulika Books during the storytelling as well. This newsletter is shorter than most, in accordance with what I must admit was my LAST New Year's resolution: "make those newsletters shorter and more frequent!" Recently, we heard a story from a remote village where we've set up a village reading room, in the home of a volunteer. This village is in the mountains of Ngoi district. It isn't on a road; the only way to get there is a 2 hour trip by boat. I'm been in Laos so long I'm not sure how someone in another country would react to that story. But to me, it was a cause for celebration. When I first came here, I heard the same thing again and again: "Lao people don't read." Most people, of course, had nothing at all to read if they wanted to; and what existed was pretty dull. Who could say what would happen if they had access to good books? Now, as we've been creating that access, with help from many of you, we're getting the answer: With good books – books that are interesting, books that help them stay healthier, or have better lives, books that are fun, books that promote education – people DO want to read. They'll even go to some effort to do it. With 170 books, and five years of experience figuring out the best ways to get books into rural villages that didn't have them before, we're now ready to do more. Will you help? In the attached proposal, we're asking you – as an individual, a school, a civic club, a church or synagogue, or just a group of people who come together to make a difference – to help us grow. The new year is a time that many of us like to set some new goals; perhaps this could be an opportunity to ask others if they'll join with you, to share your good fortune with others. Please take a look. 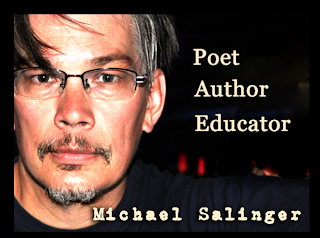 Visiting Poets in March - interested in having them? 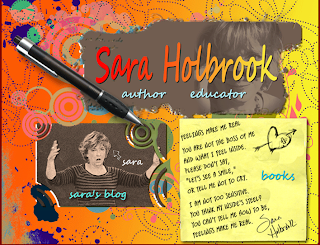 I'm having Sara Holbrook and Michael Salinger as visiting poets for 5 days at the end of March (26th-30th). Both have been highly recommended by SAS and ISBeijing. Sara is suited for the younger ages and Michael is good with Intermediate or Middle school students. Their cost is US$1,500 per day (which includes their per diem costs), so we only need to add flights and accommodation. Would anyone like to have them at the same time so we can share the costs? Please let me know as soon as possible if you have any interest, as they need to finalize their flights. 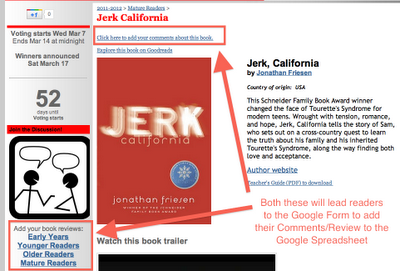 We have also added a Comments form and display at the bottom of each book's page on the website (rather than having a separate blog for each category, we decided to try using Google Forms and Spreadsheets as the vehicle -- and look forward to your feedback on how it works for you and your students). 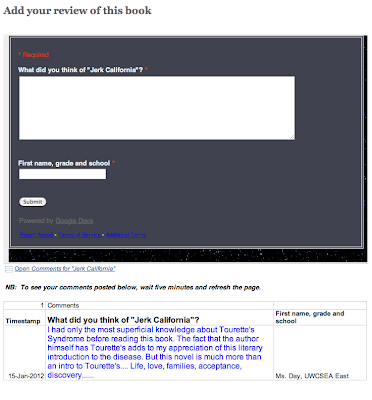 The Comments/Review form can be accessed in several ways. 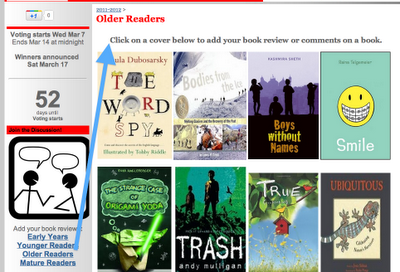 The category pages (Early Years, Younger Readers, Older Readers, and Mature Readers) allow students to easily access all the books for commenting. I am Ching Yeung Russell, author of Tofu Quilt, which was nominated for the 2010-2011 Red Dot Award in Singapore . I will go to Hong Kong (and perhaps Japan) to visit schools in the months of September and October, 2012. 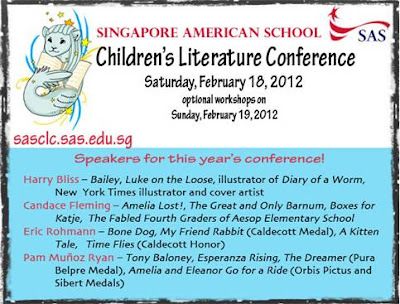 I would like to see if any of the schools in Singapore would be interested in me coming for an author’s visit. Since I will already be in Asia, I will not charge the school for airline tickets back and forth to Asia, but only for the ticket from Hong Kong to Singapore and back, room and board, and my regular daily fee of US $850 for four sessions. If several schools in Singapore invite me, they can share the transportation cost. You can check my website for more information. If this request is too late, please keep my name and information for your end-of-the-year librarians meeting for consideration of a visit next year. I hope I can hear from you regarding this matter. 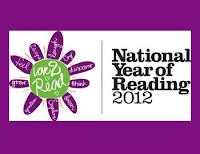 2012 has been designated the National Year of Reading in Australia. A website of resources has been developed to promote reading with adults and children which you will find useful with your school community. 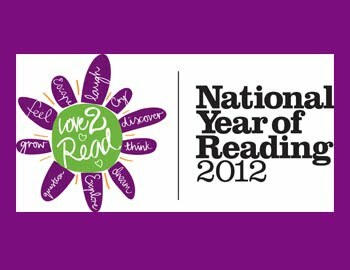 To receive regular updates from the website you can join the mailing list or follow on twitter @love2read2012. 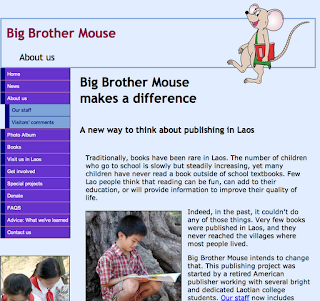 The Love reading>for children link is especially useful, containing an excellent list of blogs and websites for book selection and reading promotion for children. 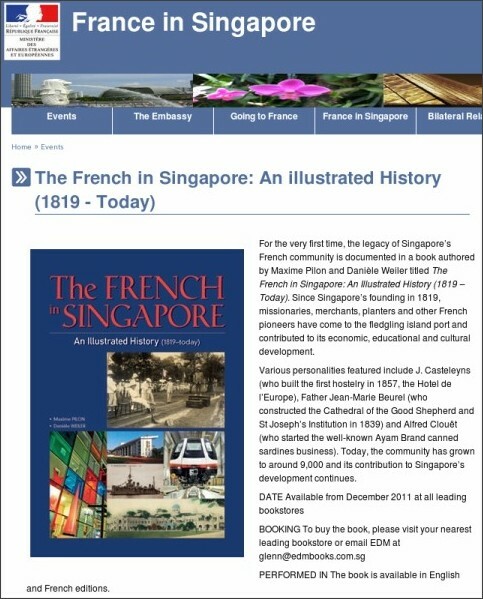 Yes, one of our members has just published a book. Congratulations, Daniele! Contact Daniele if you want her to come and speak at your school. FYI: Judy Kong has returned to the MOE. Ms. Mardhiah Mahamood is her replacement at the Bukit Merah library.